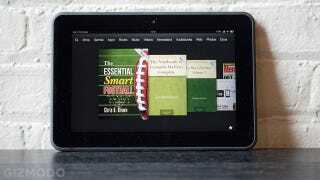 Is Amazon's 8.9-Inch Kindle Fire HD a Flop? 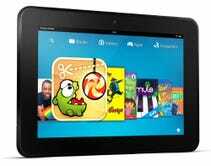 You've probably heard by now that Amazon's offering fifty bucks off every 8.9-inch Kindle Fire HD. But while that's great news for you, it hints at disappointing early days for Amazon's big-boy tablet. Is the 8.9-inch Fire HD dying on the vine? It would seem unlikely at first; Amazon recently crowed that it had sold more Kindles than ever over Black Friday, though it refused (as always) to acknowledge how many had left its warehouses, or what kind. Still, it's clear that Amazon moves millions of Kindles; wouldn't its most premium version be at the top of most peoples' wish lists? But consider that Amazon's significant discount comes less than a month after the 8.9-inch Kindle Fire HD shipped. That's odd, considering that Amazon slashes prices on its own goodies only when it's trying to clear out inventory. For them to be worried about a surplus less than three weeks after launch implies that Amazon either sorely overestimated demand, or there wasn't any to begin with. Or, you know, both. That's not all. All versions of the 8.9-inch Kindle Fire HD—there are eight SKUs, if you count With and Without Special Offers—are on sale today. That sale is being heavily promoted on the Amazon home page and on sites like this one. Despite that, only the very cheapest model has cracked Amazon's Top 20 in sales for Electronics. That's not promising. By contrast, seven of the top 10 products on that list are other types of Kindles. Remember, too, that Amazon promised that supplies would be limited, that we shouldn't delay our purchases. And yet! Every model is still fully available as of 1:30 this afternoon (EDT). So... what's the hurry? None of this is to say that the 8.9-inch Kindle Fire HD is a bad tablet, or that you shouldn't buy one. It's very, very good, and the price is unbeatable. But maybe after the 7-inch Kindle Fire HD, people aren't conditioned to hand Amazon $300—or more—for a tablet. Maybe it's just too big a purchase to make outside of a special occasion, and there'll be a holiday sales tick. Maybe the iPad is still just too dominant at that size. Who can say? No one knows exactly what the sales figures are except Amazon, and they're not talking. But one thing's certain: the 8.9-inch Kindle Fire HD isn't selling as well as Amazon thought it would. It's been a disappointment for them. But at least that just translates into terrific savings for you.